Today I was invited to join the panel discussion “Apps Across the Compute Continuum: Developing Apps for Multiple Devices” at the Intel Developer Forum (IDF) in San Francisco. 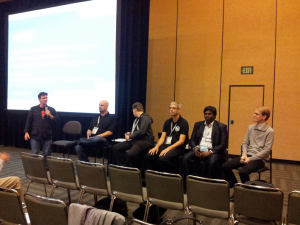 It was a pleasure for me to discuss together with other Intel Black Belts like Chris Skaggs (Soma Games), Lee Bamber and Rick Vanner (The Game Creators) and Suresh Kumar (Blue Innovations) as well as Bob Duffy (Intel AppUp Community Manager and moderator of this panel discussion) the pros and cons, but also the challenges of developing apps for multiple devices and platforms. Have you been to the IDF 2011, too? This entry was posted in Events, Intel AppUp and tagged AppUp, Black Belt, event, IDF, Intel, panel discussion, San Francisco. Bookmark the permalink. ….I’ve got my invitation around here somewhere….let me find it…..